From her first visit to Disney World in 1973 to her most recent trip, Susan has been thrilled by the magic and excitement of Disney. In addition to several trips to Disney World, she and her family have traveled to Disneyland, cruised on the Disney Magic, and spent a day soaking up the sights and sounds of Disneyland Paris! She even chaperoned school field trips on “behind the scenes” science trips to Disney World. 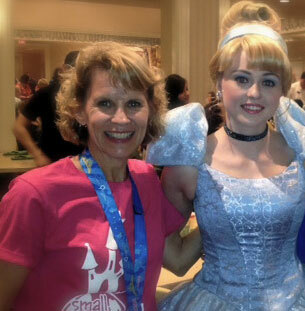 Susan has also run the Princess Half-Marathon – and, she’d love to help you plan a runDisney race trip, too! Susan is a former teacher and school administrator, and she moved to Little Rock from the Dallas area with her husband. They have two grown daughters, so they are enjoying the empty-nest lifestyle. Whether your group is two people or 20 people; infant, school-age, or “experienced” adult, Disney destinations are perfect for you. Susan is excited to work with you to plan YOUR perfect trip and help you find a new favorite Disney restaurant, plan a unique behind-the-scenes tour, or discover the wonders of another culture with Adventures by Disney.